Industrial fabrics, such as polyurethane and vinyl, are popular in environments where furniture needs to look professional but hold up to regular use. Although they are both plastic products, polyurethane and vinyl are made in very different ways and have distinct properties. 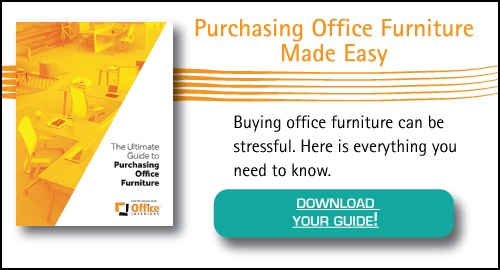 Most offices will find polyurethane furniture to be more convenient and comfortable. However, vinyl upholstery ensures that furniture will remain in top shape even through heavy use. Need to choose between a polyurethane versus a vinyl piece of furniture? In this article, we’ll look at the difference between the two to help you determine which one is best for your needs. Polyurethane is a plastic resin which is commonly used to coat surfaces. You’ll find it in a variety of forms, including adhesives, paints, varnishes, and even some types of foam. It was initially developed as a coating to increase the durability of industrial surfaces. However, since it’s plastic, we’ve been able to turn polyurethane into a fabric-like material itself. The flexible nature of polyurethane lends itself well to being imprinted with different textures. As such, it is commonly used to create particularly rich and realistic faux leather. However, unlike leather, it won’t break down, crack or develop sun damage under normal conditions. It’s also easier to clean, and, of course, it’s much cheaper than real leather. Vinyl is another type of plastic, but it is derived from ethylene, or crude oil, rather than from resins. Vinyl upholstery is created through the fusion of vinyl with a textile base, typically polyester. Vinyl upholstery finds more purposes in industrial use than does polyurethane upholstery. Much of this arises from the fact it is stiffer, therefore harder to work with overall. However, for environments which require durable, waterproof upholstery material, vinyl has a unique advantage over other types of fabrics. In comparing the qualities of polyurethane and vinyl furniture, we see that neither choice is inherently superior. Instead, choosing the right fabric falls to a matter of personal preference, and how you plan to use the furniture. Polyurethane and vinyl are both very competitive choices when an office needs durable but professional looking furniture. The ultimate decision may come down to your preferences regarding the look and feel of each. Here’s a quick rundown of when it might be better to choose one over the other. In short, polyurethane furniture blends comfort and design. Vinyl upholstery is more industrial in appearance but will hold up better against the elements and heavy use. Although they are both derived from plastic materials, polyurethane and vinyl come from dramatically different production processes. As such, they have different qualities and a different appearance. Polyurethane furniture has more style options. Vinyl, on the other hand, finds more use in industrial and professional settings. While such a difference might not make much of a difference for furniture such as sofas in your building’s lobby, it may mean a world of difference in furniture which is used all day, every day. For example, if the furniture is going to see extensive use, you may want to consider reading up on the pros and cons of upholstered chairs instead. Now that you know which type of upholstery you need, are you ready to learn how much your new furniture is going to cost or what type of warranty you can expect? 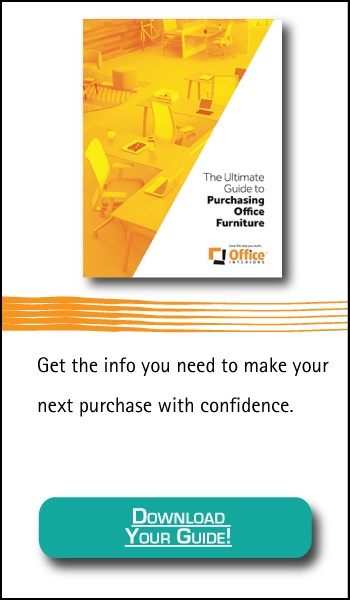 Our Office Furniture Buyer’s Guide answers these questions and more!